Oklahoma Connection | Opala graduated from Oklahoma City University in 1953. Justice Marian Opala’s first experience with Oklahomans came while he was in a German prison camp, where he was being held, when the State’s 45th Infantry Division liberated the camp. Justice Marian Opala was born in Lodz, Poland and joined the country’s Freedom Fighters when he was a young man. His group was trying to seize Warsaw from the Nazis before the arrival of Soviet forces when he was captured and thrown in a prison camp in 1944. He was freed in 1945 and immigrated to the U.S. in 1949. He received his Juris Doctorate from Oklahoma City University in 1953 and was admitted to the Oklahoma bar as a U.S. citizen. He began his legal career in Oklahoma and devoted the ensuing years as a prosecutor, adjudicator, and teacher in the field of law. 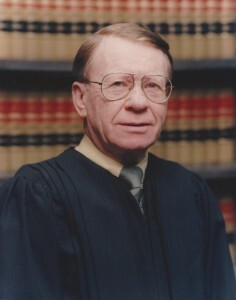 Prior to his appointment to the Supreme Court of Oklahoma in 1978, he served as Administrative Director of Oklahoma Courts, presided as judge of the Worker’s Compensation Courts, and was a staff attorney and referee for the Oklahoma Supreme Court. He served as an adjunct law professor at three Oklahoma colleges as well as the American Academy of Judicial Education and the National Judicial College. He was also the recipient of the Humanitarian Award of the National Conference of Christians and Jews.